I missed Carmina Burana, but I'm going to TESB. Thanks for this reminder. 'Battle In The Snow' should be pretty thrilling live. I am selling my tickets for Saturday's "Empire Strikes Back" on Stubhub. (Can't make it.) Terrace 2 box 1525 (four seats, meaning one complete box) plus parking. If anybody here is interested, they're yours for face value ($583 including parking, plus my processing fee of $0). After all the years of film music concerts starting to bring film music out front and center, it is kind of disappointing these to-screen concerts have taken over putting film music back behind the movie. I've completely lost my enthusiasm for them. I will be there for the John Williams night though. It's a unique presentation that literally puts the orchestra front and center! 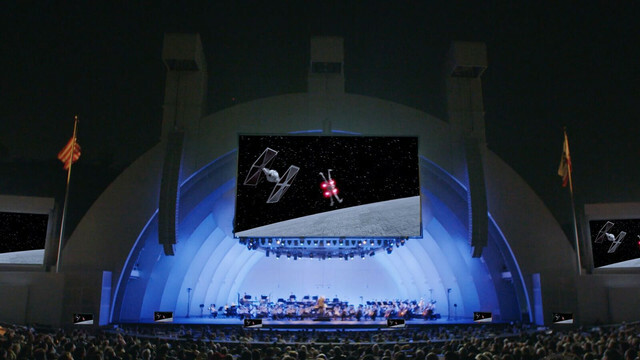 Good, all my experiences at the Bowl is like this one with dialogue and effects full on and the orchestra many times obliterated. And, usually, the orchestra is more dimly lit than pictured and the picture is up above and in front of the orchestra. In other words you might as well be just watching the film (which the majority is coming for anyway). Sadly your experience mirrors mine; the audience is not there for the music, tends to be talkative, on the night I went to Jaws I even heard a drunken,"oh look they're playing!" I do wish they'd just play the music in full just as they would a symphony but my guess is very few people would be interested so unfortunately this is the compromise we get. David Newman and the orchestra were tremendous and I feel sorry to see their work so disrespected. The orchestra may be physically front and center but not in the mind of the audience. Interesting viewpoint. The one I saw had the orchestra closer to the front of the stage and not hidden like that. Would be awesome to hear the complete score done before the film started, but oh well. Sat's TESB is practically sold out. Lots of families, no doubt, with plenty of children. The John Williams concerts are much the same, and there only half the running time has picture accompaniment. The crowds are appreciative and attentive. Are the cheap seats worth it? in New York with David Newman conducting the New York Philharmonic live to film for A New Hope, The Empire Strikes Back, The Return of the Jedi, and The Force Awakens. I actually ran into Mile Mattesino at the first night. Right now I’m texting you from Lenox, Massachussetts, where our dear John Williams will conduct his part of “Tanglewood on Parade” with 1. Adventures of Han, 2. Adagio from The Force Awakens, and 3. The Jedi Steps and Finale. Than I’m back in 4 days for “Film Night” (program to be announced - but usually similar to the Hollywood Bowl). Although last year the Bowl Program had a real extra treat with the showing of the future Oscar-wining Kobe Bryant short film with wonderful Williams music. David Newman has kind of become the resident film music conductor for the Hollywood Bowl. He conducts most of their live-to-film concerts and has done quite a few other film music concerts. For the past few years, he has also conducted the first half (before intermission) of the annual John Williams concerts. I presume Williams has reached an age where conducting the entirety of outdoor concerts in the late-Summer L.A. heat three nights in a row is just too much for him. How do they handle the edits made to the scores after they were recorded? There are several dialed out and tracked cues in Empire—I assume they make those adjustments to the scores? I believe these L2P performances replicate the editing and tracking. Somewhat unfortunate as much of Williams' unused material still fits the film. I saw Newman conduct Empire to film with the New York Philharmonic and it was overwhelming. That brass section was on fire for what amounted to a musical marathon. Newman was mopping sweat from his brow the whole time. I recommend these concerts to anyone with the means to attend. and the stormtroopers in the desert. The orchestra didnt play any of the cantina music by the way. There's no details but I assume they screen the 1997 Special Editions?